Ari and I were watching the Weather Channel late last night to find out exactly how screwed we'd be this week. As we waited for our local forecast, we were vaguely aware a news story was playing about New York City's handling of the massive snow storm that occurred there last week, but we weren't really paying attention until the news anchor wrapped up by saying, "Hopefully city officials will get to it before the rats." That's when we knew we'd missed something crucial at the beginning of that newscast. Ari and I are both reasonably sane--at least, neither of us has ever been known to hear crazy, nonsensical things for no reason--and we concluded we both heard the news anchor on the Weather Channel say something involving New York City officials and "before the rats." What snow-related shenanigans could rats possibly get into? Building tiny rat igloos all over the city streets? Ari suggested the city officials, if they waited too long to clear the snow, might arrive to discover the rats had formed kick lines across the roads and were blaring vaudeville music while doing the can-can. Then they'd curse their sluggishness and exclaim, "No! We're too late!" Ari actually explained this by acting it all out, including the can-can. Unfortunately, my puny words cannot accurately convey the humor of this. So instead, I drew a picture. Then I started adding captions. Then I started using the captions to make fun of my picture, because it definitely isn't my best work. 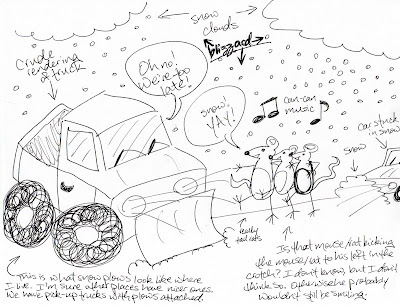 I can draw certain things well, but can-can dancing rats and snow plows aren't among those things. 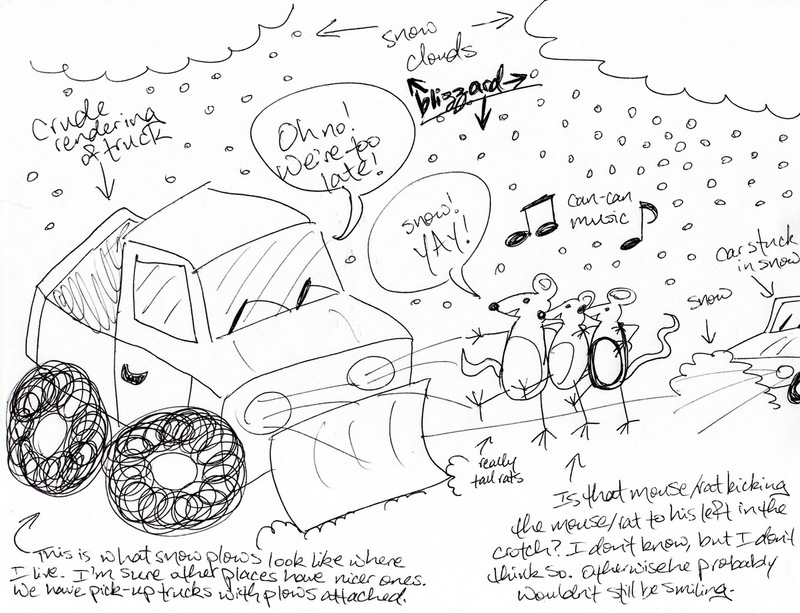 Still, perhaps you can reap some enjoyment from my rudimentary illustrations. Lately I've been wanting to incorporate drawings into my blog. I like blogs that have drawings, and I like to draw, and I have a blog. I face the slight complication of not actually having software on my Mac to draw with, but I'm not above making pen-and-ink drawings and scanning them, or finding free software to download. Still, before I posted this today, I showed it to Ari, who laughed. Encouraged, I said, "So you think people will think it's funny?" Then he shrugged and said, "I dunno," and I was engulfed in a sea of doubt. People are either going to think, "Hey, that drawing's funny, in a badly-drawn kind of way! Yay!" or "Wow, this girl cannot draw. I feel sorry for her. I'm going to leave a mean comment." But as you can see, curiosity got the better of me, and I published this post anyway. By the way: I shrank the picture so it would fit in this ridiculously narrow template that I am too inept to edit. If you can't read my sloppy handwriting, clicking the image should make it appear its actual size, which is pretty big. UPDATE: In case any of you were wondering, we found out what city officials needed to get to "before the rats": trash. Tons of uncollected trash that had been piled under the snow. I suppose that's a perfectly feasible explanation for the mysterious rat statement. Nevertheless, our minds skipped right over it and went straight to the can-can. LOVE IT.. Love the drawing...It got a good out loud laugh from me!!! First time I've read your blog. Love that too. Of course I'd like to see the drawing of Ari acting this out!!! Keep up the good writing and good drawing!